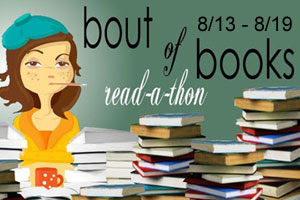 It’s time for the fifth Bout of Books read-a-thon, a week-long event where the only requirement is to read. I’ve participated in this read-a-thon several times before and have always really enjoyed it, particularly the mini-challenges. So I definitely encourage you all to sign up! The preceding paragraph, taken verbatim from the Bout of Books blog, gives the basic info; for additional details and to sign up, click the picture! My personal goals for Bout of Books 5.0 are: (1) to read for at least 30 minutes every day, and (2) to read at least three books from start to finish. I’m not sure which books I’ll be reading yet…I’ll have to do some examining of my bookshelves this weekend! ETA: I will also be posting my progress for the read-a-thon here throughout the week, so stay tuned! Time spent reading today: 40 minutes? I haven’t been keeping very close track, to be honest. Time spent reading today: 3 hours, perhaps. Time spent reading today: Maybe 30 minutes? Definitely no longer, unfortunately. Time spent reading today: I can’t remember! Maybe 2 hours? Time spent reading today: About 2 hours? Let’s be honest, I’m totally guessing at this point. Time spent reading today: 2 hours 30 minutes?? Three books seems do-able to me…I want to aim for something that’s achievable while not being too easy. Thanks, and same to you! Yeah, my “list” is still very embryonic at this point. Best. Blog name. Ever. How have I not found you sooner?! (That sounds kinda creepy. Sorry.) I can’t wait to see what you choose to read! 😀 Good luck! Haha, you’re not creepy. (I mean, probably — after all, I don’t actually know you!) I only started this blog a week or so ago, so that’s probably why you haven’t found me. 🙂 Glad you like the name! It made me laugh. I guess I do have a “starting point,” in the sense that I’m planning to read Too Good to Be True by Kristan Higgins at some point during the week…but other than that I have no idea! Keep up the great Bout Of Books progress! I really liked both of those SAA books as well. I still have The Girl Who Chased the Moon left, but unfortunately that’s all. I hope she writes another book soon! Oh, you’ve read Garden Spells! How did you like it? It’s such an enchanting story, I really liked it. You’re making good progress! Good luck for the rest of the readathon! Loved Garden Spells! Hopefully I’ll be posting a review later today. Happy reading to you as well! Thanks! Hope you are enjoying your reading as well. Thanks! I’ve had fun…though I definitely haven’t made as much progress as you have. Well done!